Girls love pink and boys like blue. Right? Is it biology or culture? In the early 20th century, an industry magazine wrote that “pink is for the boys … being a more decided and stronger color. Delicate blue was for girls.” In the image we show South Korean photographer JeongMee Yoon presenting exactly how much things have changed today, after baby clothes manufacturers and marketers made the arbitrary choice to assign pink to girls. On the biological side, a study in gender differences by Hurlbert and Ling, said that ancient women became attuned to the reds of the ripe berries and other fruits. 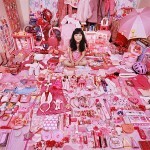 Women came to focus on the color red (and the rewards associated with it) in order to make their search easier. The doctors say that this would also come in handy for recognizing flushed faces, a sign of illness, among the women’s children. To explain the preference for blue found among both men and women in the study, Hurlbert suggested that to these ancients people, blue signified “good weather” and a “good water source” [source: The Guardian]. A 2003 study suggested that women prefer reds because their eyes are physically attuned to see reds better than other colors. This certainly supports Hurlbert and Ling’s idea of an evolutionary basis for color preferences. But their answer doesn’t encompass all of the data. It wasn’t until the 1920s that Western parents began dressing their children in colors. Before this, children of both sexes most often wore white, and both boys and girls of a young age were outfitted in dresses. Then color assignments among boys and girls evolved in the ’20s but the colors were reversed: pink was for boys and blue for girls. Somewhere in the 1940’s colors flip-flopped to the assignment we recognize today [source: The Guardian]. This lends support to the notion that the color preference between pink and blue comes from culture rather than biology. But times are changing and some parents refuse the color coding of gender roles siting that these stereotypes are limiting to the child. It will be interesting to see the girls’ clothing and toy aisles in ten to twenty years.